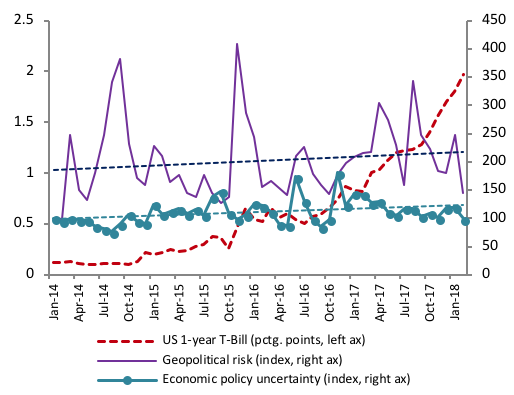 During 2016-17, market analysts and policymakers grappled with the puzzling coexistence of subdued market volatility and heightened policy uncertainty and geopolitical risk. The rise in world growth expectations can explain some but by no means all of the decline in market volatility during this period. This column argues that excess optimism about future growth prospects might have fuelled the decline in volatility. This would imply that gradual unwinding of such expectations could bring more bursts of market volatility, as we have begun to witness since the start of 2018. Equity market volatility, as measured by the VIX index (a popular measure of stock market volatility)increased significantly in the first quarter of 2018, reaching a level not seen since early 2016 on a monthly basis (Figure 1). 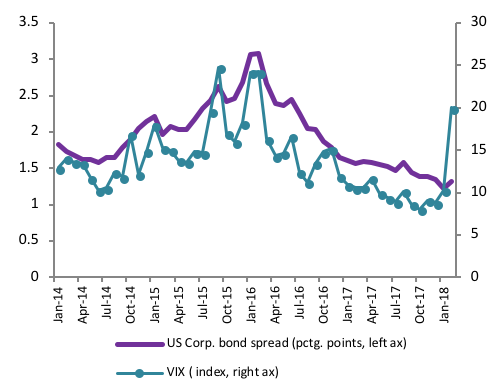 During 2016-2017 volatility as well as credit risk (as measured by corporate bond spreads, also Figure 1) fell steadily, despiteelevated and slightly increasing economic policy uncertainty and geopolitical risks (Figure 2). Short-term interest rates have also been on the rise since December 2015, when the Fed started to normalise monetary policy in the US after more than a decade of historically low interest rates and quantitative easing (Figure 2). In a new paper, we show theoretically and empirically that country-specific volatility can be affected by shocks to the global business cycle (or ‘real factor’), proxied by innovations to world GDP growth, as well as shocks to a composite global ‘financial factor’ (Cesa-Bianchi et al. 2018). The latter is shown theoretically to be a mixture of second and higher-moments of innovations to world output growth. The second factor, when empirically extracted from the data, could also capture other non-fundamental financial components such as bubbles/crashes, optimism/pessimism, and other non-fundamental drivers that can temporarily affect world equity markets volatility. To identify and extract these two common factors from the data, crucially we take a multi-country perspective and note that real GDP growth correlates across countries much less than measures of equity market volatility (Figure 3). We then show that volatility is driven by at least one more common factor as compared to output growth, in line with our theoretical findings. Figure 3 plots the average pair-wise correlation of volatility (yellow bars) and output growth (blue bars) for each country, together with the average across all countries (dotted lines).1 It shows that the average pair-wise correlation across all countries for volatility (0.58) is more than twice the average for growth (0.27). This evidence suggests that volatility is much more strongly correlated than growth across countries, and is consistent with our theoretical model where one common factor is not enough for explaining cross-country variations in volatility. 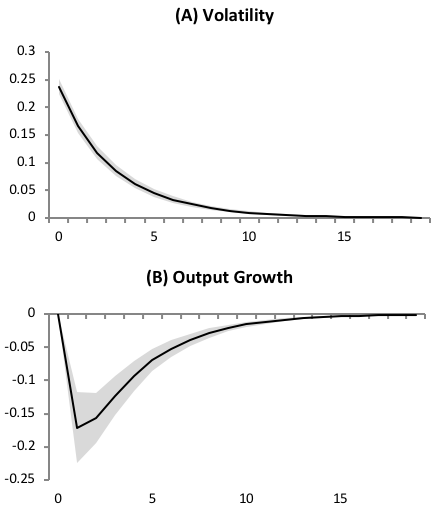 Under the assumption that volatility is driven by at least one more common factor than growth, the real factor is shown to be proportional to world GDP growth, measured as the weighted average of country-specific growth rates, while the global financial factor is identified as the component of global volatility that is not explained by the real GDP growth factor. Figures 4 and 5 plot estimated shocks to our common financial and real factors against changes in measures of US financial uncertainty constructed by Ludvigson et al. (2015), as well as changes in a proxy for the world risk free rate obtained from the estimates of Holston et al. (2017). 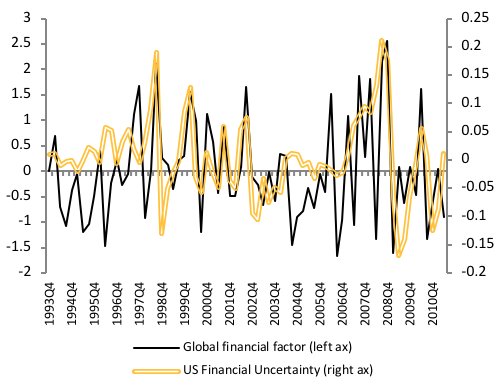 [2 As can be seen, our global financial shocks are only weakly correlated with changes in Ludvigson et al.’s measure of US financial uncertainty (with a correlation coefficient of less than 0.4), and differs from it particularly during the period of so-called Great Moderation. Thus our global financial factor (which, as noted above, captures higher moments of world growth innovations, as well as other non-fundamental components) contains additional information relative to country-specific measures of financial uncertainty. 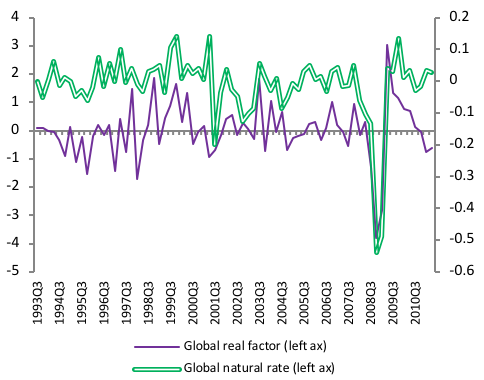 In contrast, shocks to our real factor, which are common to both country-specific volatility and output growth, are more closely correlated with changes in the proxy for the global risk-free rate due to Holston et al. (with a correlation coefficient of 0.65). Importantly, in the paper, we show that the shocks to the real factor accounts for the bulk of the unconditional correlation between volatility and growth that is well known to characterise the data in the US and most other countries around the world. 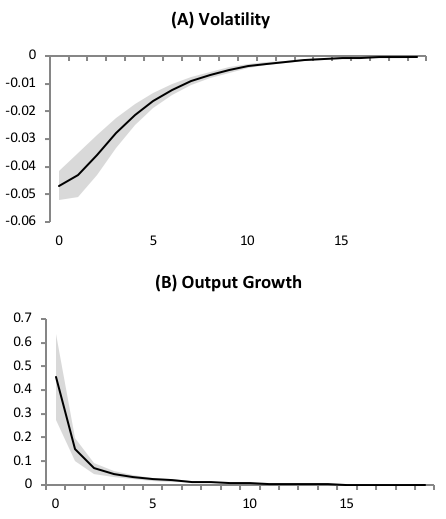 In our framework, a positive shock to the real common factor leads to an increase in output growth, and to a fall in country-specific volatility (Figure 6). While positive shocks to the common financial factor increase country-specific volatility and depress economic activity (Figure 7). As our theoretical model shows, and Figure 5 above illustrates, world growth can affect country-specific volatility via its link to the global risk-free rate. Within the context of our multi-country framework, benign market volatility developments during 2016 and 2017, on the backdrop of a heightened global economic and geopolitical uncertainty, can be explained by higher world output growth expectations, combined with excess optimism in international equity markets about world economic prospects that might have offset increased fundamental risks in the world economy. While financial factors such as bubbles and optimistic beliefs are difficult to measure, expectations of accelerating world growth are quantifiable. Figure 8 reports the cumulative forecast revision for one-year-ahead world GDP growth starting from January 2014 (dark thick line), together with the VIX index (thin line with circles). Changes in expectations about world growth are measured with monthly revisions in Consensus Economics forecasts for world growth. The figure shows that, during the 2014-15 period, the forecast for world GDP was downgraded steadily. Since the start of 2016, however, forecast revisions started to be positive, as shown by the upward trend of the dark solid line in Figure 8, with a cumulative change of slightly less than one full percentage point. 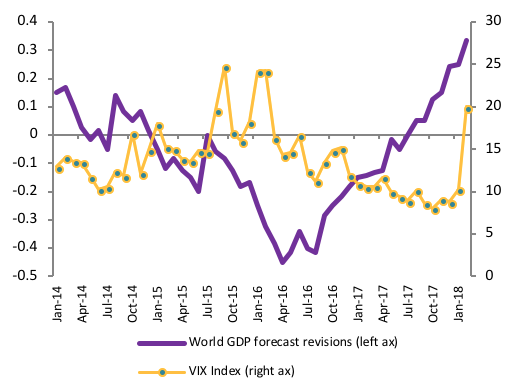 The negative correlation (-0.3) between world GDP forecast revisions and the VIX index can be clearly seen in Figure 8. Source: Consensus Economics and FRED. According to the elasticities implicit in the impulse responses in Figures 6 and 7, innovations to global growth can explain some, but not all the decline in realized volatility around the world. Our estimates suggest that the elasticity of country volatility to the common real shock is small, approximately 0.1. Accordingly, a one percentage point increase in world growth would lead to a drop in country volatility, on average, of only a tenth of a percentage point. As the unconditional average of volatility across countries is about 11% per quarter, such a shock would reduce global volatility by only 1% per quarter. Considering for instance the VIX index, which has an unconditional average value of about 20 in our sample, such a common real shock would reduce it by roughly only 2 points. In contrast, the VIX declined from 24 to 8 during the 2016-18 period (Figure 1), implying that innovations to the real factor cannot fully account for its behavior. Consistent with our theoretical and empirical analyses, we conjecture that, during 2016-17, increased risk, picked up by measures of economic policy uncertainty and geopolitical instability in Figure 2, was more than offset by favorable innovations to the financial factor. The latter, in turn, might have been driven by excessively optimistic expectations about future global growth, ruled out in models like ours that impose “no-bubble” conditions, but possibly present in the data. Expectations of an even faster rate of global GDP growth do not seem compatible with the assessments of the Fed and other central banks around the world. With policy rates on a tightening path, it is unclear how much more can world output growth accelerate in this phase of the cycle. It is, therefore, plausible that we see further bursts of increased market volatility of the type we have already witnessed over the past three to four months, if world growth expectations start to adjust downward to more plausible levels. Baker, S R, N Bloom and S J Davis (2016), “Measuring economic policy uncertainty”, Quarterly Journal of Economics 131: 1593-1636. Caldara, D and M Iacoviello (2018), “Measuring geopolitical risk”, International Finance discussion paper 1222, Board of Governors of the Federal Reserve System (US). Cesa-Bianchi, A, M H Pesaran and A Rebucci (2018), “Uncertainty and economic activity: A multi-country perspective”, CEPR Discussion Paper 12713. Gilchrist S and E Zakrajsek (2012), “Credit spreads and business cycle fluctuations”, American Economic Review 102(4): 1692-1720. Holston, K, T Laubach and J C Williams (2017), “Measuring the natural rate of interest: International trends and determinants”, Journal of International Economics 108(S1): 59-75. Ludvigson, S C, S Ma and S Ng (2015), “Uncertainty and business cycles: Exogenous impulse or endogenous response?”, NBER working paper 21803. The average pair-wise correlation of a variable for a given country (i.e. each bar in Figure 3) is the average bilateral correlations between one country and all others in the sample for that variable. This is the simple average of the country estimates reported by Holston et al. (2017).